I was recently telling a friend about this loading I did a few years back (few? Eeek! It’s been 9 years ago! ), where I developed a fast and heavy 30-30 load for moose hunting. Was thinking about it again today, and realized that, as far as I remember, it’s never been posted here. Figured I should put it here, at least for archiving purposes. Anyone interested in this really should go and read all of that thread, there is A lot of good information there, and some more of my thinking and learning before developing this loading data, is there in that conversation. I got to adding and subtracting and extrapulating data one afternoon in early 2007, and this was the result. All Starting data used is from my Speer #13 manual. 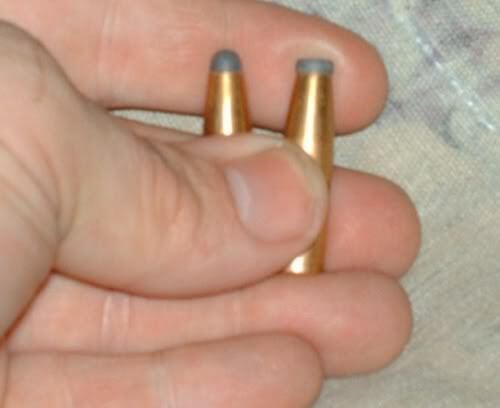 Between the two powders, same velocity (within+/- 90fps), same charge, same bullet in the 300 savage, Aplied for both 170 and 200 bullets . Meaning that the powders were comparably in presure/velocity gained, one just gets there slower. 2 grains powder decrease for every 10 grains bullet increase, in both 4064 and 4320 for the 300 savage. The same 2 to 10 ratio decrease/increase is also used for the 30-30 with the 4064, it just stops giving you data when it gets to 170grn bullets. SO, I started with a 28grn (rounded from 27.5 for even numbers..) starting load for the 170 in the 30-30, and subtracted 6 grains of powder for the weight increase to 200 grandma of bullet. Subtracted 2 more grains for good luck/good measure. Thats a load of 20 grains of 4320. 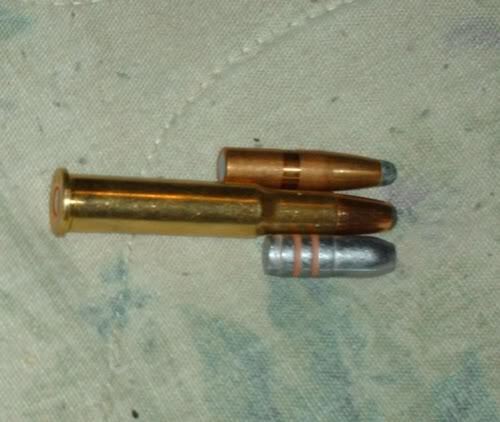 Now, these bullets are a bit pointier than I’d like in a tube mag, so I lightly taped the exposed lead tips with a hammer(2.5# shord sledge. ) Just upset the curve and made flat noses out of them. 22.5 grains; No difernce to the 20, slightly more kick, but not much. acurate at 50 yds. 25 grains; , No pressure signs, recoil like a 22Mag rifle… acurate at 50 yds. 27.5 grains, Slightly flatter primers.Kick like my plinking round of 28grns 4064, with the 170. acurate at 50 yds. 30 grains, No primer or pressure sign change. still extracts good. kick like federal power shock with 170s. Still quite acurate. 32.5 grains, same as 30 above, slight more kick. Yes, still acurate. I was extremely happy with finding a low enough starting point, especialy for fudged and adapted data from one powder to another, and from a diferent cartridge. I didn’t blow up the gun. Happy that I ran it up to a recoil and sound that feels healthy, with no visual, or felt problems. I had then stopped at this point, until my chrony arrived, for actual velocity, partly to know, and partly for a better educated guess as to the pressure. factory 165grn Federal round, 200grn bullet used, and 170 grn cast I usualy load. Seating depth comparison to factory round. Deep ain’t it? From left to right, progression of flatening(or lack there of) of primers, from 22.5 to 32.5 garins. 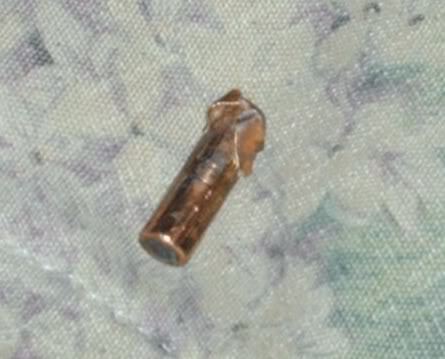 Recovered bullet from first shot with 20 grains, at ~12 to 15 yards(angled into a 2″x6″) Too bad I didn’t recover anything from the 50yds shots. Later when my crony arrived, I did fire several rounds through it, and as I recall, at around 27 grains, it hit 2000 fps. At this time, that is from memory… I can’t find my notes now that have the recorded velocity data. 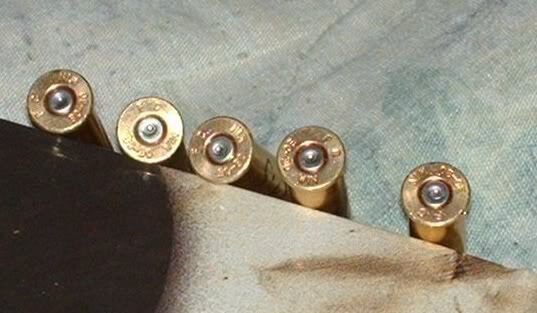 I do know for sure that they hit 2000 fps, and did so before 30 grains of powder. I think it was at 27, but I’m only 90% sure. I never did get to hunt with the load, and bullets and powder being expensive in this size, I never did any more range work with it… I remember I had it accurate at 100 yards, but that’s about all. An acquaintance on a reloading forum ran a verry similar load through pressure test equipment some time after I did this, and it tested well out of the max range for my rifle. But internet data, is, well, internet data… Use and trust at your own risk! I wouldn’t trust pressure readings without seeing them for myself, or seeing them properly documented. BUT at the same time, if you give that guy any benefit of the doubt at all, then my data is NOT safe. And the Same rules, both ways, apply to using my data… 😉 Again, use and trust at your own risk! Meaning, it works and shoots in my gun, and it didn’t blow up…. But I DO NOT recamend or condone it’s use in any other gun. Use my data at your own risk, I am Not responsible for what happens with your loads in your gun(s). I have the data, and trust it to be used sparingly in my rifle, and wouldn’t have a problem loading them again, to sight in with, and then hunt with a few rounds… But the possibilities of being unsafe are still there enough to keep me from doing it Often. It was a fun project, and I have the outcome I was shooting for, it’s nice to know, generally, that the velocity I wanted with the projectiles I wanted, Are possible to achieve. but given other guns and cartridges I now have, I have no need to use it.